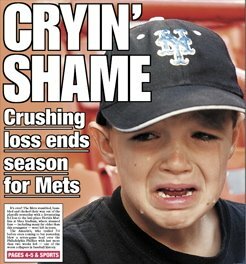 The New York Mets have a history of being underdogs. They lost their first official game to the St. Louis Cardinals on April 11, 1962; they lost their first game at the Polo Grounds, their first home, to the Pirates on April 13, 1962; they lost their first game at the fondly missed Shea Stadium to the Pirates again on April 17, 1964; and they lost the first game at their beautiful new ballpark Citi Field to the Padres on April 13, 2009. There have been few highlights—only two World Series wins in 1969 against the Orioles and in 1986 against the Red Sox—to counter the many heartbreaks with this team, particularly those in recent memory—they lost the NLCS in 2006 to the Cardinals; destroyed a seven game lead with a heart crushing series of losses in 2007; and repeated this performance in 2008, losing a 3 ½ game lead over 17 games, capping off the year by losing the last game at Shea to the much despised Marlins. and that highly identified fans are more likely to report than lowly identified fans that they would be willing to anonymously assist their team by engaging in illegal or immoral behaviors (Wann, Hunter, Ryan, & Wright, 2001). For highly identified fans, knowledge and dedication seem to be markers of pride. It's possible that this bears them through disappointment. To give up on the team after a loss, or devastating series of losses, means minimizing one’s status as a fan. After all, players are to some extent representative of the people. We align ourselves with teams and players because they are the manifestation of some personal belief—whether that notion is sportsmanship or work ethic, they represent us on some level. So to give up is to give up on ourselves, which is why fans continue to wear the shirts, buy the tickets, yell at the television, and do other strange things. It’s a ridiculously emotional connection, but it’s there. I don’t collect plastic Mets cups. Nobody collects plastic Mets cups. We collect stuff with Mets logos, sure. And we keep our cups because they have Mets logos, but it’s not a hobby or a passion or an obsession, not one I’ve encountered in my Met travels … You wind up with the cup because you bought the soda. Or you wind up with the cup because somebody else bought the soda and you’re not too proud to scoop it up when that person doesn’t care enough to take it home. It’s not why you went to the game. It’s just what you wound up with when you left. I think this is part of the script between the highly identified fan and the team. Franklin (1985) talked about the "baseball ethos": the cultural understanding and the spirit of baseball that participants and spectators bring to the game (284). Fans have an understanding of what the game will entail, and they hope for a win, but know it could very well be a loss. The fans who hang in there, through the disappointments, may do so in the spirit of community because as strange as this may sound, that disappointment actually binds them to the team. Okay, fans, your turn. Why do you hang in there? Well the ratio of fans and disappointment seems to be similiar in the world of games well that depends on the players that how they are fulfilling their needs.